Finnish Antti Tuomainen was an award-winning copywriter when he made his literary debut in 2007 as a suspense author. The critically acclaimed My Brother's Keeper was published two years later. In 2011, Tuomainen's third novel, The Healer, was awarded the Clue Award for 'Best Finnish Crime Novel of 2011' and was shortlisted for the Glass Key Award. Two years later, in 2013, the Finnish press crowned Tuomainen the 'King of Helsinki Noir' when Dark as My Heart was published. With a piercing and evocative style, Tuomainen was one of the first to challenge the Scandinavian crime genre formula, and his poignant, dark and hilarious The Man Who Died became an international bestseller, shortlisting for the Petrona and Last Laugh Awards. 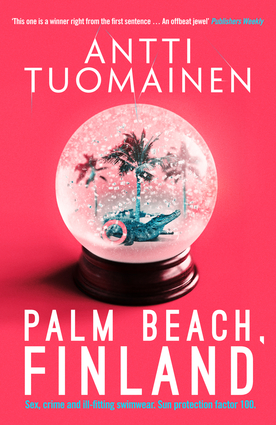 The recently published Palm Beach, Finland has been a massive critical success, with Marcel Berlins of The Times calling him 'the funniest writer in Europe', and making it one of his books of the year.